An ecosystem is a closely woven web of plant and animal life within a particular type of physical environment. 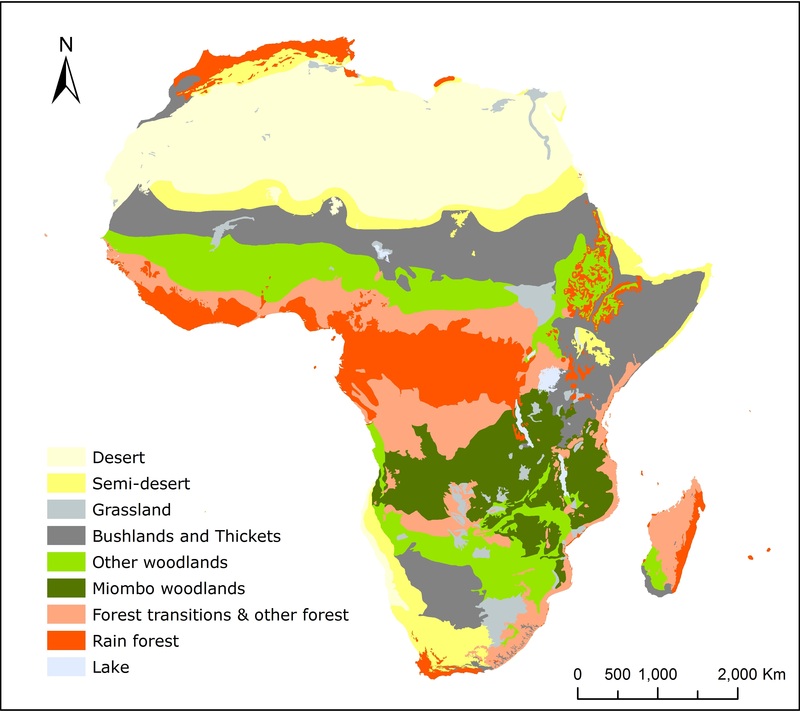 Africa has five main kinds of ecosystems: coastal environments, deserts and semideserts, mountain environments, savanna grasslands, and forests. Each ecosystem has its typical environment and climate, and the people who live there have adapted to its conditions and learned to use its resources. Africa has three coastlines—along the Mediterranean Sea in the north, the Atlantic Ocean in the west, and the Indian Ocean in the east. These shores consist of stretches of sand, soil, or rock. In general, plants and animals on Africa’s western coast are less varied and numerous than on the eastern coast. The coastal environments of Africa include coral reef, lagoon, mangrove, salt marsh, and seagrass ecosystems. Coral reefs are made of the skeletons and shells of millions of tiny sea creatures. Long chains of coral just off the eastern coastline of Africa have created sheltered warm-water environments in which many species of marine life can flourish. Fewer reefs are found on the west coast, where unprotected cliffs are battered by cold water and heavy surf. All African coasts have lagoons—shallow bodies of water separated from the sea by a strip of land—and river deltas—fan-shaped areas at the mouth of a river formed by deposits of mud and sand. Because lagoons and deltas harbor large populations of fish, shrimp, and shellfish, they are among the most economically important coastal ecosystems. However, some of them have been harmed by pollution and construction projects, notably in western Africa’s Gulf of Guinea. A floating weed called water hyacinth has also caused damage to lagoons and deltas. Mangroves are trees that grow along warm, muddy coastlines. In Africa, mangrove ecosystems occur most commonly in sheltered deltas and lagoons along the continent’s tropical and subtropical coasts. In the vast swamps of the NIGER RIVER AND DELTA, mangrove trees reach heights of 17 feet, though elsewhere they are shorter. The tree’s roots rise out of the water, providing habitats for snails, barnacles, oysters, and algae. Mangroves also protect shorelines from storm damage and erosion and serve as a local source of wood. Throughout Africa, however, mangrove ecosystems are threatened by oil spills and by the clearing of coastal lands for industrial, agricultural, or construction purposes. Salt marsh ecosystems, found at the mouths of rivers in southern Africa, are dominated by low-growing grasses and plants that tolerate high levels of salt in the water. Seagrass ecosystems occur in shallow, protected areas of offshore sand or mud. They consist of underwater plant meadows that nurture a variety of creatures. Seagrass meadows are more widespread and diverse off the eastern coast, but they are also found off the coast of Angola in the west. Africa has two large areas of little rainfall and scant vegetation—the SAHARA DESERT across the northern part of the continent and the combined Namib Desert and KALAHARI DESERT in the southwest. Each region consists of both true desert and semidesert, which is somewhat moister. The northern fringe of Africa is a narrow zone of Mediterranean climate and ecosystems, with mild winters, hot and dry summers, and vegetation similar to that found in southern Spain and Italy. To the south of this area lies the vast expanse of the Sahara, the world’s largest desert. Scientists divide the Sahara and the land around it into three zones—Saharan, Sahelian, and Sudanese—although the boundaries between these zones are gradual rather than sharp. The Saharan zone receives less than six inches of rain per year. The climate changes little with the seasons, and rainfall is rare and highly irregular. Only about 500 species of plants, mostly shrubs and grasses, live in the Saharan zone, and few animals flourish there. One famous exception is the camel, well adapted to browsing on desert vegetation and going without water for long periods. South of the Saharan zone—and less forbidding—is the Sahelian zone, which receives up to 24 inches of rain per year and is crossed by the NILE, Niger, and Senegal Rivers. Vegetation includes thorny trees, bushes, fruits, wild grains, and herbs. Nomadic herders guide cattle, goats, and camels through this region, taking advantage of temporary water sources such as pools of rainwater. Farther south still, the Sudanese zone receives more than 24 inches of rainfall and supports an even greater variety of plant and animal life, as well as agricultural settlements. The Namib Desert, along Africa’s southwest coast, receives almost no rain, but cold water currents offshore make the Namib humid and foggy. Its vegetation consists of many hardy varieties of grass, and its animal life includes the jackal, hyena, oryx (an antelope with straight horns), springbok (a gazelle), and zebra. The nearby Kalahari is an immense semidesert region that has long been home to hunter-gatherer peoples, including the KHOISAN. The Kalahari’s landscape is a thorny bush plain or grassland resembling the Sahelian zone of the Sahara, with trees such as acacias, baobab, and doom palms, and animals such as giraffes, eland (an antelope with twisted horns), and gnu (an antelope with curved horns). Montane, or mountain, ecosystems have their grandest example among the ATLAS MOUNTAINS, a series of ranges stretching across the northwestern corner of Africa. The High Atlas range in MOROCCO has several snowcapped peaks. Its northern slopes receive rain and support high meadows of alpine flowers and grasses, dense thickets of shrub, forests of cedar and pine, and Mediterranean trees such as cypress and olive. Its southern slopes are dry with desert vegetation such as date palms and esparto grass. Most of sub-Saharan Africa is fairly flat and low, but the eastern part of the continent, from ETHIOPIA to SOUTH AFRICA, includes several regions of high elevation. The Ethiopian Highlands and the Ruwenzori Mountains of UGANDA and eastern CONGO (KINSHASA) are high enough that trees cannot grow near their peaks. Other areas, such as South Africa’s Drakensburg range, are low enough to be forested. TANZANIA’s Mount Kilimanjaro at 19,340 feet and KENYA’s Mount Kenya at 17,058 feet are the continent’s two highest peaks. Kilimanjaro is an active volcano, and Kenya is an extinct volcano. Unique alpine ecosystems exist above the tree line on Africa’s eastern mountains, where the temperature has been described as “summer every day, winter every night.” The plants and animals that live there have adapted to the conditions. Most ground-dwelling insects, for example, have a natural “antifreeze” in their body fluids. Below the alpine zone is the montane zone with various types of forest, particularly podo tree and bamboo. Numerous animals are native to the montane zone, including mountain gorillas, monkeys, elephants, buffaloes, and rodents. Beginning in the 1900s, people cut and cleared large areas of Africa’s montane forests, which are suffering from soil erosion and the disappearance of certain species. Savannas occupy more than half of Africa’s land surface. A savanna is a tropical plain with both trees and grass. The typical image consists of a broad grassland dotted with large trees and herds of grazing animals such as zebra and antelope. However, in some savanna ecosystems, trees cover more than half of the area. Africa has two main types of savannas, fine-leaved and broad-leaved. Fine-leaved savannas occur in dry areas with fertile soil. Trees—typically the short, thorny acacia—cover less than 30 percent of the land. Grasses grow evenly and are a rich source of food. In these savannas animals consume a substantial amount of the plant growth. Broad-leaved savannas are found in moist areas with relatively poor soil. Trees, mostly thornless, cover more than 30 percent of the land. The grass, which is low in food value, tends to grow in tall bunches. People who live on this type of savanna often set fires to the vegetation to improve the soil for crops. But generally the major plant-eaters on the savannas are not human. Caterpillars may suddenly appear and devastate the broad-leaved savannas, while swarms of grasshoppers and locusts may descend on the fine-leaved savannas. Savannas contribute to the economy in a number of ways. They provide firewood and timber for many Africans. They are the main grazing lands for livestock, and their use as agricultural lands is expected to increase. In addition, the savannas contain all of Africa game parks, which attract many tourists. A forest is a continuous group of trees whose crowns interlock and cast enough shade to prevent grasses from growing. Africa’s various forest ecosystems include tropical rainforests; thick, high-branched forests that wind through savanna woodlands along rivers; and groves of tiny dwarf trees that grow high on mist-wrapped peaks. Tropical and humid forests occupy about 7 percent of the continent’s total land area. Five thousand years ago, before human activities such as burning and clearing land began on a large scale, forests covered three times as much ground. Today, the major forest areas are along the eastern and southern coasts, the central mountains, and in the Guineo-Congolian region that stretches across central Africa. The forests’ boundaries are mainly established by water and human activity. Rainfall is the most important factor in determining what type of forest will develop and how far it will extend—although groundwater from rivers or swamps can also support forests. The influence of humans has also been enormous. Forests provide many useful products, including timber, skins, meat, and medicines. Modern deforestation—loss of a forest as a result of human activities—has been devastating.